Marut is a 10 year old Pit Bull that has struggled with orthopedic issues basically his whole life. 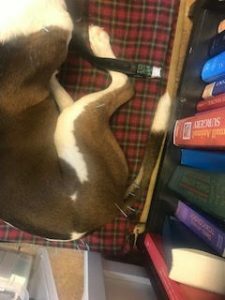 He’s had multiple surgeries and is on many different medications to help manage his pain. Recently, his limping has worsened. Marut attends swim therapy sessions once to twice monthly. He has had increased limping and stumbling progressively over the last 5-6 months. Still happy, still wants to play/ run. He eats Darwin raw food. 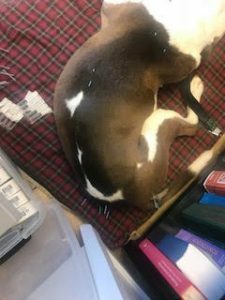 He has had a history of allergies as well, and was on VARL allergy desensitization injections but is no longer on them and seems to be managed well. He occasionally will chew his paws. EENT: mm pink/moist, CRT<2, mild tartar. Missing 108 (previously fractured and extracted). Fractured 102 and 202, stable. Ears clean. Cardiac/lung: Auscultation wnl. No murmurs/arrhythmias. No crackles or wheezes. Musculoskeletal: Severely abducted elbows. Shuffling of back legs with abducted kness. Head hangs low when walking with head bob. Mild to moderate left front lameness. Elbow joint effusion. Shifts weight off of front legs when rising to standing. Thick, ropy muscles in neck and shoulder area. Muscle wasting of front legs. Decreased range of motion in back legs. Palpable surgical implants in knees. Thick, ropy hamstring muscles. Integument: Scars under both eyelids (previous entropion surgery). Neurologic: Hind leg CP’s and withdrawal reflexes WNL. Does shuffle his feet, owner says he’s always done that. Most diagnoses were made from radiographs and physical exam. Most of his pain seems to be related to neck, left elbow, and right hip so I focused on those areas (elbow points, hip points, and neck points). Bai Hui, GV14, and ST36 for central anti-inflammatory effects (also possibly ST36 to help with allergies as well). Bladder 15 for central effects to elbow and also to relieve some tight rhomboid muscles. Hamstrings palpated tight, so possibly trying to compensate for weakened/painful hips so I added in BL 36. Also, a couple of trigger points in triceps/shoulder areas around SI9 and GB21 and Bladder 18. Needles are left in for 15 minutes each side. (P will only lay on one side at a time). Seirin 0.2 long needles. Tried to use Carbo needles 0.2, but P doesn’t tolerate them well (cries/flinches). Tolerates the Seirin needles much better. Started with 0.15, worked up to 0.2. Tolerates the E Stim quite well. 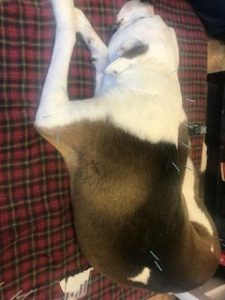 When we first started doing acupuncture, Marut did quite well. He would go home and act like a puppy his owner reported. The older he gets, the slower and more painful he seems. I think the treatments are helping to stabilize him and keep him mobile, but I’m no longer seeing such dramatic effects.